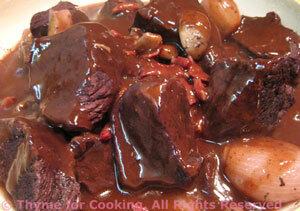 Beef Bourguignon, classic, Thyme for Cooking gourmet main Course. I finally discovered the secret to the rich, unctuous red wine sauces in Boeuf Bourguignon and Coq au Vin: cocoa. This will make enough for 2 meals. The original version calls for pearl onions but I normally have to buy a huge bag to get the few I want so I use shallots.. plus I like the taste better. Trim beef and cut into 2 inch (5 cm) cubes. Put into a small, deep bowl or sauce pan. Peel the carrot and cut in thirds. Add the carrot, garlic and bouquet garni to the beef. Add the red wine and the vinegar, cover and refrigerate for at least 4 hours or overnight. Take the meat out of the marinade and let it drain, reserving all of the marinade. Heat oil in small stock pot or Dutch Oven. Add beef and brown on all sides, about 10 minutes. Pour the reserved marinade over the beef, along with the carrot, garlic and bouquet garni. Cover and bring to a boil. Reduce heat and let simmer for at least 3 hours. Cut mushrooms in half or quarters if large. Add mushrooms and shallots to skillet and sauté over medium heat until nicely browned, about 10 minutes. Add mushrooms, shallots and bacon to beef. Simmer for 30 minutes. With slotted spoon take everything out of the sauce (don't worry about the bacon) and put on a small platter. Discard bouquet garni and carrot. Keep warm in the oven while you finish the sauce. Bring sauce to a boil over medium - high heat. Whisk in cocoa and let reduce for 5 minutes. Slowly whisk in cornstarch mixture to thicken. You probably won't need all of it so stop periodically and let it cook to test consistency. It clears as it cooks and thickens. Spoon some sauce over the beef, shallots and mushrooms and serve, remaining sauce on the side.